Is there a way to use a drop down for U.S. states when using the Address option under Quick Tools? Is there a way that you can set the State/Province field, that appears when using the Address option under Quick Tools, to only State and have it as a dropdown? 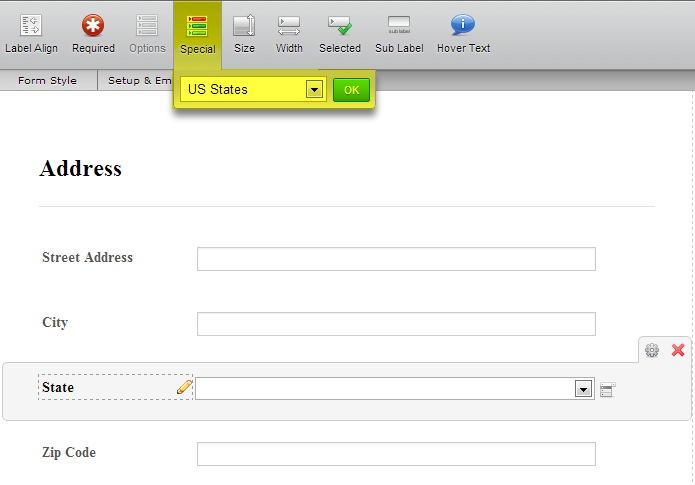 Or is the only way to do this to instert a separate drop down and choose the U.S. states special option? Unfortunately, there is no easy way to set the State field as the Drop Down on the Address tool. You are right about the special option for Drop Down, I would like to suggest using this work around.